Now that all the veterans of the First World War have gone, it is painfully apparent that we no longer have their memories as a primary source to draw upon. 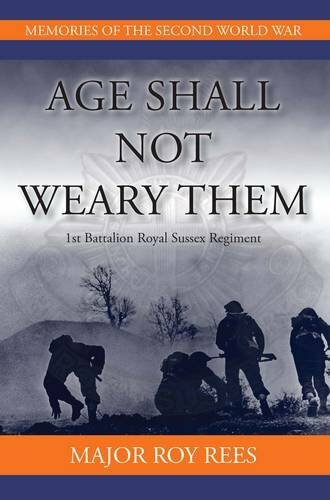 Whilst many of those who fought in the Second World War are now in their nineties and beyond, it is therefore good to see that they are still penning their memoirs and biographies. The author joined the Territorial Army in 1938. At the beginning of the war he was undertaking duties at home until recommended for officer training in March 1941. Undertaking further training, troop exercises and courses at home, he was posted to the 1st Battalion Royal Sussex Regiment and travelled to Tunisia in 1943. The main threat was from shelling and mortars, and Rees writes quite vividly about being under fire. The successful campaign in Tunisia tended with the surrender of the German general von Armin and his troops. Rees then spent further time in Africa and the Middle East before heading to Italy in January 1944. Here he was thrown into the hell of Monte Cassino. Taking up position in the nearby Point 593, the soldiers lived in sangars amongst the rocky outcrops. There are further parallels to the fighting in the First World War, with regular patrols into no man’s land. A constant stream of casualties were incurred from the shelling, patrols, and the bitter fighting for the area. Following the capture of Cassino Rees saw service on the Adriatic front and the Gothic Line. He was then sent to Greece and spent time in Salonika, dealing with the internal unrest. He was here when VE Day was celebrated. Post-war he then spent time in Austria, Italy and Germany. Some of Rees’ recollections are quite fractured and the accounts are by no means a comprehensive account of the battles that his battalion played a part in. At times his prose does not seem able to capture the experiences that he no doubt experienced, particularly at Monte Cassino. However Rees had a varied war and his account is illustrated with copious photos form his personal collection. Whilst this account may not be heralded as a ‘classic’ memoir, it is in its own way an important contribution to the history of the battalion and the campaigns it was involved in.